Known as the 'City of Sails' because of it enchanting harbourside location and the affiliation the dwellers of Auckland have with the ocean. Visitors can enjoy the bustle of the city with its many shops, restaurants and cultural attractions. Take a boat trip across the harbour and explore the wonderful islands and beaches. Situated between two vast harbours, Auckland is known as the ‘City of Sails’ for its superb location and the local residents’ love of the sea. Located in the North Island, Auckland is New Zealand’s largest city and is a paradise for lovers of water sports and sailing enthusiasts with a higher ratio of boats to people than anywhere else in the world. As with the rest of New Zealand, Auckland is a stunning location from which to enjoy the great outdoors – explore the beautiful sandy coves and beaches dotted along the coastline, hike, horse-ride, fish or bungy jump from the Harbour Bridge. Most of the world's major international airlines operate flights into Auckland, New Zealand. If you're travelling from the UK, there are no direct flights to Auckland, New Zealand as a short transit or change of aircraft is required on route. Fly via the Middle East, Far East or USA and take the opportunity to enjoy a stopover for a few days and explore a new city and culture. 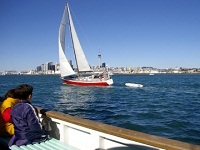 Enjoy the superb city scenery by ferry, sail boat, classic yacht or even on an America’s Cup racing yacht. Relax and immerse yourself in Auckland’s buzzing waterfront scene with its trendy cafes, restaurants and nightlife. Twice the size of London, Auckland is home to barely half a million multiculturally diverse inhabitants. First settled by New Zealand’s indigenous people – the Maori, the rich Polynesian culture has been further enhanced by migrants from the neighbouring Pacific Islands. Head to Auckland’s museums and galleries, take a guided walk through the city or amble through the weekend markets for a taste of the sights and sounds of the South Pacific. Auckland’s busy downtown is dominated by the tallest building in the southern hemisphere – the Sky Tower. Enjoy the breathtaking views over Auckland from the 3 viewing platforms or if you’ve got a good head for heights, SkyJump (base-jump) 192 metres straight down! Further afield, head north to the beautiful Bay of Islands with its amazing marine wildlife or south to the geothermal spa-town of Rotorua. At Directflights.com, we're passionate about finding you the best value for money and the cheapest flights to Auckland, New Zealand available. Comparing prices with over 500 airlines worldwide, we're confident we can find you the top deals on cheap flights to Auckland, New Zealand and destinations across the globe. Whether you're planning your trip well in advance or needing lastminute flights to Auckland, New Zealand, try our flight search box for the latest prices and availability. Auckland has warm summers, which falls between November and March, when temperatures can reach into the high 20’s. During the winter months (June-September) the city can still enjoy maximum temperatures of up to 15˚C and lows of 7˚C. The winter is also when the city receives more rainfall and humidity can reach 84.